Well my thoughts are turning to the project that Elaine has chosen for us from the February edition of Craft Stamper magazine, Jean Hardy's Enveloped Elegance. 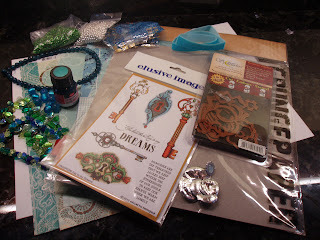 I am planning to use some new stamps that I have just bought from Graphicus called Key to my Dreams. These are gorgeous stamps, and the keys are crying out to be stamped onto grungepaper and embellished with crystals, or some sort of gilding. I have pulled together some beads from my jewellery making stash in turquoises and greens, and then found some Bo Bunny and Papermania papers in the same colour range. I also have some Nestie flower shapes, as I may make a metal flower with a Papermania make it youself brad, (see photo), which I plan to paint with some lovely metallic paint. Oooh, you have some fabulous colours going on in their Judith. Love those stamps! Well, that all looks very interesting, and, as Lesley says, gorgeous colours. Those new stamps are lovely too, aren't they? Oooh you have some lovely things here, Judith. Those new Elusive stamps are stunning. They are definitely on my wish list. Can't wait to see what you do with them. Ooh Judith, turquoise PM paint, it has to be one of my absolute favourites. Those key stamps are beautiful too, so detailed. I am really looking forward to seeing what you do with your beads. I have a huge stash that don't get nearly so much attention as they should!